Book Review: Parinoush Saniee's "The Book of Fate"
Home » books » dead ink » review » Book Review: Parinoush Saniee's "The Book of Fate"
Massoumeh is a young woman growing up in Iran in the 1970s. Having met a young man on the way to school, she falls victim to her first experience of love and desire. Hoping she may one day marry this boy, her world is turned upside down when her brothers discover his innocent love notes to her. Believing their sister has brought dishonour to their family, her brothers force her into an arranged marriage with Hamid. Massoumeh soon discovers that her husband is a revolutionary, with little interest in her or her children’s life. When her house is raided and Hamid is arrested one night, she must work out a way to support her children. 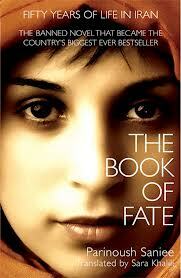 At once a story about tragedy, oppression, and war torn Iran, The Book of Fate is also a tale of endurance, determination, and great inner strength. Knowing very little about the history of Iran, the novel was enlightening. Tracing the country’s history from the oppressive regime of the Shah to the signing of the Theocratic Constitution in 1979, and the Iran-Iraq War, the book provides a sense of what it was like to live in the country at this unstable time. While Massoumeh’s story is one of pain and suffering, her voice is one of hope for women. The book was banned twice in Iran, and one assumes this is because of its political content, but also because of its portrayal of a strong independent woman, who finds her way out of hardships when others would have given up hope. It is her determination which reveals to the Western reader that there have been, and always will be women who rile against the oppressive traditions of their culture, albeit quietly.